Padua (Italian: Padova IPA: ['padova], Latin: Patavium, Venetian: Padoa) is the capital city and the economic and communications hub of Padova province, in the Veneto region of northern Italy. The region's variety of natural and cultural resources attracts the tourism of 20 million foreign and 24 million domestic visitors each year. Padua is famous as the city where the poet Dante lived, where Saint Anthony of Padua is buried, and as the setting for most of the action in Shakespeare's play, The Taming of the Shrew. The city is picturesque, with a dense network of arcade lined streets opening into large communal piazze, and many bridges crossing the various branches of the Bacchiglione River, which once surrounded the city's ancient walls like a moat. Padua's Orto Botanico di Padova was the world's first academic botanical garden, created in 1545. The garden continues to serve its original purpose as a center for scientific research. It was named a World Heritage Site in 1997, noted by UNESCO for its contributions to the development of many modern scientific disciplines, notably botany, medicine, chemistry, ecology, and pharmacology. Tronco Maestro Riviera: A pedestrian walks along a section of the "inland waterway" or naviglio interno of Padua. Padua stands on the Bacchiglione River, 25 miles (40 km) west of Venice and 18 miles (29 km) southeast of Vicenza. The Brenta River, which once ran through the city, still touches the northern districts. Its agricultural setting is the "Venetian plain," and to the city's southwest lies the Euganaean Hills, praised by Lucan and Martial, Petrarch, Ugo Foscolo, and Shelley. Padua has a Mediterranean climate. The average maximum temperature in July is around 84°F (29°C), and can be hot, humid, and somewhat energy-sapping. The average maximum daytime temperature in January is 45°F (7°C). January, February and March are the months with the least rainfall, so days can be crisp and stunning (if there's no fog). Mean annual precipitation is 26 inches (677 mm). The city center is surrounded by the 11 km-long city walls, built during the early 16th century. There are only a few ruins left, together with two gates, of the smaller and inner thirteenth century walls. There is also a castle, the Castello. Its main tower was transformed between 1767 and 1777 into an astronomical observatory known as Specola, and the other buildings were used as prisons during the nineteenth and twentieth centuries. In the surrounding district are numerous noble villas. This tempera, Two Christians before the Judges, hangs in the city's cathedral. The apse area of Santa Sofia. 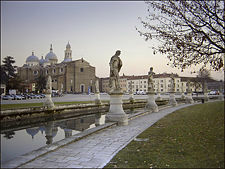 The central location and numerous rivers has meant that the area around Padua has been inhabited since the earliest times. Patavium, as Padua was known by the Romans, according to legend, was founded in 1183 B.C.E. by the Trojan prince Antenor, who was supposed to have led the people of Eneti or Veneti from Paphlagonia to Italy. Patavium was inhabited by (Adriatic) Veneti, famed for their excellent horses and wool. The city was a Roman municipium since 45 B.C.E., and became so powerful that it was reportedly able to raise 200,000 fighting men. The Roman historian Livy was born near there in 59 B.C.E. The area is said to have been Christianized by Saint Prosdocimus (died 100 C.E. ), who is venerated as the first bishop of the city. The Huns under Attila invaded Padua in 452, Gothic kings Odoacer (435–493), and Theodoric the Great (454–526) controlled the city. During the Gothic War (535–552), it submitted to the Greeks in 540. The city was seized again by the Goths under Totila, but was restored to the Eastern Empire by Narses in 568. Padua fell under Lombard control. In 601, the city rose in revolt, against Agilulf, the Lombard king, who besieged the city for 12 years before storming and burning it. The Padua of antiquity was destroyed. All that remain of Roman Padua are the remains of an amphitheater (the Arena) and some bridge foundations. At the Diet of Aix-la-Chapelle, in 828, the duchy and march of Friuli, in which Padua lay, was divided into four counties, one of which took its title from the city of Padua.Magyars sacked the city in 899. At the beginning of the eleventh century, Paduans established a constitution, set up a legislative assembly, and a credenza, or executive body. During the next century, Padua fought Venice and Vicenza for the right to use the Bacchiglione and the Brenta waterways. The great families of Camposampiero, Este, and Da Romano began to emerge and to divide the Paduan district among themselves. The citizens elected a podestà, a chief magistrate, from the Este family. Padua belonged to the Lombard League, an alliance formed around 1167, which included most of the cities of northern Italy. A fire devastated Padua in 1174, requiring reconstruction of the city. In 1236, Frederick II established his ally, the infamous and cruel tyrant Ezzelino III da Romano (1194–1259) in Padua and the neighboring cities. Ezzelino was unseated in June 1256. Padua then enjoyed a period of peace and prosperity. Work on the basilica of St. Anthony was begun, the university (the third in Italy) was founded in 1222, and the city exhumed a large stone sarcophagus in the year 1274 and declared it to represent the relics of Trojan prince Antenor. 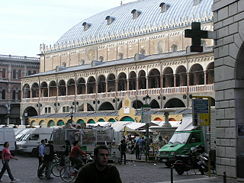 Padua's growth brought conflict with Can Grande della Scala (1291–1329), the lord of Verona, and in 1311, Padua yielded to Verona. 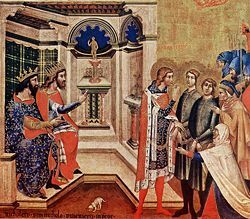 Jacopo da Carrara was elected lord of Padua in 1318, and to 1405, nine members of the Carraresi family succeeded one another as lords of the city. The Carraresi period was variously described as a golden age and a period of restlessness, for the Carraresi were constantly at war. In 1387, John Hawkwood won the Battle of Castagnaro for Padova, against Giovanni Ordelaffi, for Verona. Padua passed to Venetian control in 1405, and remained thus until the fall of the Venetian Republic in 1797, apart from a brief period when the city changed hands (in 1509) during the wars of the League of Cambray. Two Venetian nobles, a podestà for civil and a captain for military affairs, each elected for 16 months, governed the city. Two chamberlains managed the treasury, and every five years the Paduans sent a noble to reside as nuncio in Venice, and to watch over Padua's interests. Venice fortified Padua with new walls, built between 1507 and 1544, including a series of monumental gates. In 1797, the Treaty of Campo Formio ended the Venetian Republic, and Padua was ceded to the Austrian Empire. After the fall of Napoleon, in 1814, the city became part of the Kingdom of Lombardy-Venetia. Padua began its industrial development, and one of the first Italian rail tracks, Padua-Venice, was built in 1845. In Padua in 1848, in the year of revolutions, students revolted on February 8, turning the university and the Caffè Pedrocchi into battlegrounds in which students and Paduans fought side by side. In 1866, in the Battle of Koniggratz, Italy pushed the Austrians out of the old Venetian republic as Padua and the rest of the Veneto joined the new Kingdom of Italy. Despite being at the center of the poorest area of Northern Italy, the city flourished. It was an important agricultural market, the university was a cultural and technological center, the city hosted a major military command and numerous regiments, and industry developed. When Italy entered World War I (1914-1918) on May 24, 1915, Padua became the command center of the Italian Army. The king, Vittorio Emanuele III, and the commander in chief Cadorna lived there during the war. After Italy lost the battle of Caporetto in October 1917, the front line was situated just 50-60km from Padua, within range of the Austrian artillery. The city was bombed several times (incurring about 100 civilian deaths). A memorable feat was Gabriele D'Annunzio's flight to Vienna from the nearby San Pelagio Castle air field. Austrian forces collapsed after the battle of Vittorio Veneto in October 1918, and the armistice was signed in Padua on November 3, 1918, with Austria-Hungary surrendering to Italy. During the war, industry progressed strongly, and this gave Padua a base for further post-war development. In the years immediately following the Great War, Padua developed outside the historical town. But strikes and clashes swept Padua as war veterans struggled to re-enter civilian life. The Fascist party came to be seen as the defender of property and order against revolution, and Padua was the site of one of the largest Fascist rallies, when 300,000 people attended one Mussolini speech. Buildings surrounding Piazza Spalato, the railway station, the new part of City Hall, and part of the Bo Palace hosting the university, were constructed in the Fascist style of architecture. 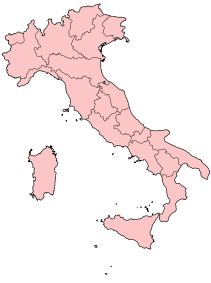 After Italy's defeat in World War II (1939-1945) on September 8, 1943, Padua became part of the Italian Social Republic, a Nazi puppet state. The city hosted the Ministry of Public Instruction of the new state, as well as military and militia commands and a military airport. The Resistenza, the Italian partisans, was active against both the new Fascist rule and the Nazis. Padua was bombed several times by Allied planes. The worst hit areas were the railway station and the northern district of Arcella. During one of these bombings, the beautiful Eremitani Church, with Mantegna frescoes, was destroyed. Some art historians considered this to be Italy's biggest wartime cultural loss. Partisans and British troops liberated the city on April 28, 1945. Padua is a city, or comune, in the Veneto region of northern [[Italy], one of Italy's 20 regions, of which Venice is the capital. Italy's 100 provinces have their own local elections. Each province has a prefect who is appointed by and responds to the central government, which he locally represents. 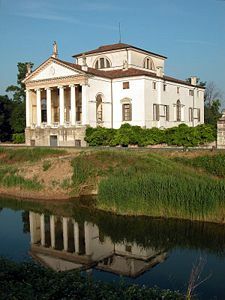 The Veneto region is one of the major tourist destinations in Italy, attracting some 20 million foreign and 24 million domestic arrivals each year through the variety of natural and cultural resources it has to offer. Padua is an important rail and road junction, as well as being an agricultural, commercial, and major industrial center. The industrial area of Padua was created in 1946, in the east part of the city, to become one of the biggest industrial zones in Europe. The main offices of 1,300 industries are here, and 50,000 people from throughout the world work here. The industrial zone alone has two train stations, one port, three truck terminals, two highway exits, and numerous services including hotels, and post offices. Manufacturing involves electrical and agricultural machinery, motorcycles, chemicals, and artificial and synthetic textiles, and processed food. Padova Centrale is the largest of the city's numerous train stations. A freeway with 20 exits surrounds the city, connecting districts and the small towns of the hinterland. Three motorways radiate from the city. Although the Padua airport is no longer served by regularly scheduled flights, Padua is relatively close to airports at Venice, Verona, Treviso and Bologna. Urban public transport includes buses and a new tramway line. A metro line was planned in 2008. The center of the city is restricted to vehicles owned by residents and permitted vehicles. Padua's population was 212,500 in 2008. The city is sometimes included, with Venice (Italian Venezia), in the Padua-Venice Metropolitan Area; population 1,600,000. In the five years between 2002 and 2007, the population of Padua grew by 2.21 percent, while Italy as a whole grew by 3.85 percent. As of 2006, 90.66 percent of the population comprised Italian people. Most immigrants came from other European nations (mostly Romanians, Moldovans, and Albanians) 5.14 percent, sub-saharan Africa 1.08 percent, and East Asia 1.04 percent. Italian is the official language. The city is predominantly Roman Catholic, but immigration has brought Orthodox Christian, Muslim, and Hindu followers. The University of Padua, founded in 1222, has a long and illustrious list of professors and alumni, containing, among others, the names of Bembo, Sperone Speroni, the anatomist Vesalius, Copernicus, Fallopius, Fabrizio d'Acquapendente, Galileo Galilei, Pietro Pomponazzi, Reginald, later Cardinal Pole, Scaliger, Tasso, and Sobieski. The university hosts the oldest anatomy theater (built in 1594). The university also hosts the oldest botanical garden (1545) in the world. The botanical garden Orto Botanico di Padova was founded as the garden of curative herbs attached to the University's faculty of medicine. It still contains an important collection of rare plants. Padua is the home of Calcio Padova, a football team that plays in Italy's Serie C1 division, the Petrarca Padova rugby union team, and a volleyball club, once called Petrarca Padova too, which plays in the Italian first division. Basketball, cycling (Padua has been for several years home of the famous Giro del Veneto), rowing (two teams among the best ones in Italy, Canottieri Padova and Padova Canottaggio), horse-riding and swimming are popular sports also. Stadio Euganeo, for football and athletics, has about 32,000 seats; Stadio Plebiscito for rugby union, has about 9000 seats; Palazzetto dello Sport San Lazzaro for volleyball and basketball, has about 5,000 seats. The F1 racing driver Riccardo Patrese (vice-champion 1992, 3rd place in 1989 and 1991; holds the world record for having started the most Formula One races) was born and lives in Padova; the racing driver Alex Zanardi also lives in Padova. The place of Padua in the history of art is nearly as important as its place in the history of learning. The university attracted many distinguished artists, such as Giotto, Fra Filippo Lippi, and Donatello. For native art there was the school of Francesco Squarcione, whence issued the great Mantegna. Padua is also the birthplace of the architect Andrea Palladio, known for 16th century "ville" (country-houses) built in Padua, Venice, Vicenza and Treviso, and of Giovanni Battista Belzoni, an adventurer, engineer and Egyptologist. 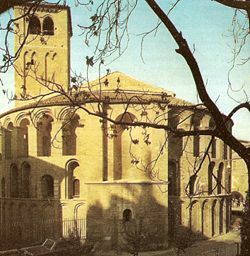 The Antonianum, built in 1897, by the Jesuit fathers, became the center of the resistance against the Nazism during World War II. Antonianum. From its windows students could see St. Giustina. The Basilica of St. Giustina, facing the great piazza of Prato della Valle. The Scrovegni Chapel (Italian: Cappella degli Scrovegni), which is Padua's most famous sight, houses a cycle of frescoes completed in 1305, by Giotto, and stands on the site of a Roman-era arena. The Palazzo della Ragione, which with its great hall on the upper floor, is reputed to have the largest roof unsupported by columns in Europe. The hall's length is 81.5 meters, its breadth 27 meters, and its height 24 meters, and the walls are covered with allegorical frescoes. The Palazzo was begun in 1172 and finished in 1219. In 1306 Fra Giovanni, an Augustinian friar, covered the whole with one roof. The internal partition walls remained till the fire of 1420, when Venetian architects removed them, forming the present great hall, the Salone. Beneath the great hall, which is decorated with a cycle of 333 frescoes, there is a centuries-old market. The Palazzo del Capitanio, which was the residence of the Venetian governors, with its great door, the work of Giovanni Maria Falconetto, the Veronese architect-sculptor who introduced Renaissance architecture to Padua. The Basilica di Sant'Antonio da Padova, locally simply known as "Il Santo," which is the most famous Paduan church. The bones of the saint rest in a chapel richly ornamented with carved marble. Donatello's magnificent equestrian statue of the Venetian general Gattamelata (Erasmo da Narni) can be found on the piazza in front of the Basilica di Sant'Antonio da Padova. The Prato della Valle, which is a symbol of Padua, is an elliptical square, believed to be the biggest in Europe, after Red Square in Moscow. The abbey and the basilica of Santa Giustina, which was founded in the fifth century on the tomb of the namesake saint, Justine of Padua, is the location of the tombs of several saints—Justine, St. Prosdocimus, St Maximus, St Urius, St Felicita, St Julianus, as well as relics of the Apostle St. Matthias and the Evangelist St. Luke. 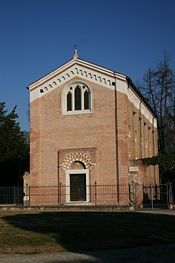 The Church of the Eremitani, which is an Augustinian church of the 13th century, and contains the tombs of Jacopo (1324) and Ubertinello (1345) da Carrara, lords of Padua, and the chapel of saints James and Christopher, formerly illustrated by Mantegna's frescoes. This was largely destroyed by the Allies in World War II, because it was next to the Nazi headquarters. The old monastery of the church now houses the municipal art gallery. The Santa Sofia, which is most likely Padua's most ancient church. The crypt was begun in the late tenth century by Venetian craftsmen. It has a basilica plan with Romanesque-Gothic interior and Byzantine elements. The apse was built in the twelfth century. 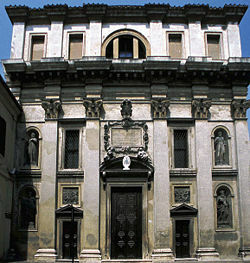 The church of San Gaetano (1574-1586), which was designed by Vincenzo Scamozzi on an unusual octagonal plan. The interior, decorated with polychrome marble, houses a precious Madonna and Child by Andrea Briosco, in Nanto stone. The Caffé Pedrocchi, built in 1831 by architect Giuseppe Jappelli in neoclassical style with Egyptian influence. This is a little jewel of history and art for a café open for almost two centuries. It hosts the Risorgimento museum, and the near building of the Pedrocchino ("little Pedrocchi") in neogothic style. The Basilica of Saint Anthony of Padua. Standing on a history of nearly 3,000 years, Padua's position in the history of art is nearly as important as its place in the history of learning. The University of Padua, founded in 1222, the World Heritage Site Orto Botanico di Padova first developed in 1545, the Palazzo della Ragione, with its huge unsupported roof, the Scrovegni Chapel, and the Basilica di Sant'Antonio, which holds the remains of Saint Anthony of Padua and many other notable sights, continue to attract a steady flow more than 40 million visitors annually. Tourism alone could guarantee a sound economy for Padua. The city also has one of the largest industrial zones in Europe, and is an important railroad and highway junction. Chierichetti, Sandro. 1973. Padua; an Illustrated Guide-Book with Plans of the Monuments. Padua: B. Facchinelli. OCLC 1047092. Gasparotto, Cesira. 1981. Padua: City of Saint Anthony. Venezia: Edizioni Storti. OCLC 56106326. Kohl, Benjamin G. 2001. Culture and Politics in Early Renaissance Padua. Aldershot, Hampshire: Ashgate. ISBN 9780860788713. Lumley, Robert, and John Foot. 2004. Italian Cityscapes: Culture and Urban Change in Contemporary Italy. Exeter, UK: University of Exeter Press. ISBN 9780859897372. Maret, Russell. 2008. Mediaeval in Padua. New York: Russell Maret. OCLC 251491396. All links retrieved January 10, 2019. This page was last modified on 10 January 2019, at 16:11.